This was my first trip with Puckett Excursions and I will definitely do it again!! I'm not usually one for group travel, like to explore and get lost on my own usually. But the small group and adventurous approach with Puckett Excursions has changed my perspective. Looking forward to the next destination with Chris and his team!!! The sights and sounds of staying in the campsite humbled my ego. Each night falling asleep to the sounds of elk looking for their mate and the coyotes howling at the full moon reminded me that we share this land. Puckett and his team paid close attention to every detail, I loved coming back to camp to see a full spread of snacks and my bed made. I enjoyed meeting all the new people on the journey and hearing their stories on the trails and around the campfire. I highly recommend going on any adventure you can with Chris Puckett! What I also found awesomely cool was the fact that our camp ground was perfectly staged for our arrival, the attention to detail is totally five star. Our tents were strategically placed for privacy but yet a community was formed. Each tent set up was precisely done from our names inscribed in a wooden tablet hammered in the ground, our bedding perfectly arranged with double height inflatable beds, cozy comforters, cotton sheeting, down pillows, and even the smallest detail of providing the essential toiletries. Contrasting with the physically demanding hiking adventures, we had very comfortable accommodations and the food was superb. Everything in the trip happened like clockwork and there was very little wasted time. I can't put into words how exciting it was. I will always mark this down as one of my life's most amazing adventures. I look forward to going on another excursion with Chris in the future. Once is not enough. One of the best parts of these excursions is that he takes cares of everything - from the pampered sleeping arrangements, to the on-site camp chef and meals, to the scenic trails. Even better is the knack he has for pulling together a great group of guys, with a laid back vibe and camaraderie. I highly recommend booking your next trip with Chris and his team - if you're looking for a one of kind, memorable vacation. In today's busy world, getting an outdoor/hiking trip together with all of the equipment, permits, logistics, and research is just impossible. Chris and his team made the trip to Zion National Park so effortless it felt like a treat. With Chris' expertise, we completed some challenging hikes and really got out to see the rugged beauty of Zion and Bryce Canyon. I can't say enough good things about my experience with Puckett Excursions. From the campsite, to the food, to the hikes, to the drinks - everything was thoughtfully planned and fabulously executed. First off, I was greeted at camp with a custom crafted cocktail from Garrett, the camp mixologist (and hiking assistant) before heading to my tricked out tent - complete with air mattress, comfy sheets and toiletries set up by Chris and his partner Chris. I'm definetly going on another trip with Chris next year and plan to bring a group of friends. I can't imagine any other way of camping! Chris made all the arrangements, secured us the best spots in some of the most beautiful campsites, and planned breathtaking hikes for each day. Coming from New York City, Chris always provides everything I need other than the my hiking boots taking much of the stress out of traveling and trekking the wilderness. Not only does he have extensive knowledge of each National Park or attraction we have visited, he sets a tone for the trips that gives me the confidence to physically and mentally challenge myself during our outings.  Puckett Excursions is the best way to experience not only the national parks but also the world.. Chris Puckett has an amazing ability to find the most amazing hikes. I've been on all of them so far and I'll try to go on as many as I can this new year. I couldn't ask for more from these trips.